Rationalists Yoda's Hovel: Scott Walker: Soooper Genius. Scott Walker has a 16 point lead (56-40) among likely voters in his race for governor, according to a poll from Wisconsin Public Radio/St. Norbert’s. Among registered voters, his lead is essentially the same (55-40). 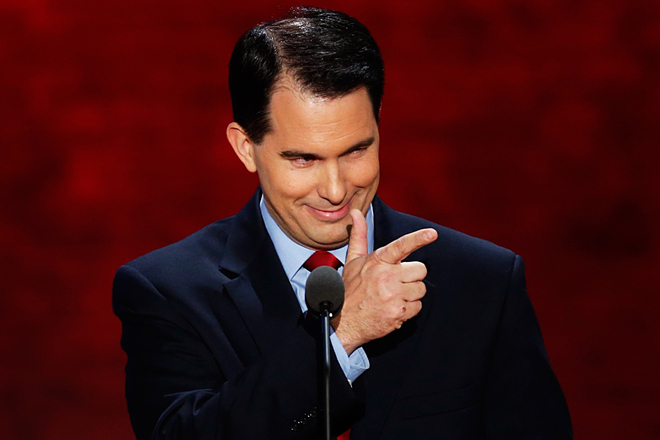 Let’s assume that Scott Walker is reelected decisively in November. In that event, it’s clear that he will receive a boost among Republicans nationally. The buzz among Republican accompanying a big Walker victory would probably dwarf the considerable buzz that followed Chris Christie’s runaway win in New Jersey. Many conservatives had serious doubts (or worse) about the New Jersey governor even when he was riding high. No serious doubts exist for Walker, although most conservatives will want to learn more before embracing him as a presidential candidate. Ya know why Scott's awesome? Because he's effective. So's Obama, you say? Yes, Obamacare, his economic policy, and his social policies have been effective but the effect is negative. Scott's is positive. He posiffective. I'm coining it.